Dating back to the Gunpowder plot of 1605, Somerset carnivals are an annual celebration with over one hundred illuminated floats (or carts as they’re known) and performers of all ages from the local carnival clubs. Thousands of lights, miles of electrical cable and hundreds of moving parts go into making this an amazing spectacle. 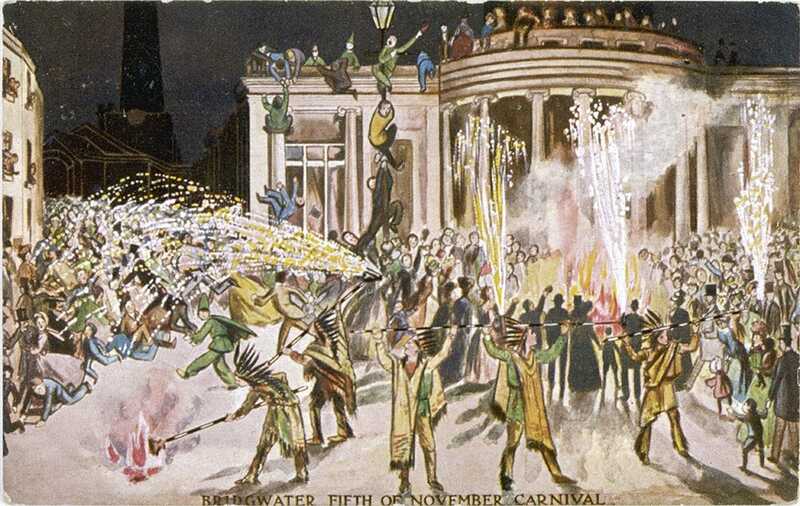 Bridgwater is the first and largest of the carnivals and the only one where there is ‘squibbing’ after the procession. Squibbers walk poles with exploding fireworks through the town, scattering the crowds with burning embers. After Bridgwater, the procession tours seven towns including Burnham-on-Sea, North Petherton, Shepton Mallet, Wells and Glastonbury. Find out more details on the official Somerset Carnivals website. It’s often cold (and rainy) on carnival night. The shows can last several hours so if you want to go the distance, make sure you come prepared. Take a flask of tea, coffee or hot chocolate to insulate you from the inside. Make sure you remember to wear your hat, scarf and gloves! It’s a good idea to get there early if you want to have a decent view. To avoid lots of standing around, take a lightweight folding chair or one of our handy Folding Flip Stick Seats. Our snuggly, Mohair Knee Blanket will keep you cosy whilst you’re sitting down. Keep your legs and feet warm and toasty with a pair of our Thermal Softhold® Seam-free Knee High Socks. Don’t worry if it’s wet and windy. Our Minnie and Stanley waterproof shoes are windproof and 100% waterproof so your feet will stay warm and dry. If you’re wearing boots or wellies, warm them up with a pair of our Luxury Sheepskin CosyCushion™ Insoles. It’s all done for charity, but it’s a free show, so make sure you take plenty of loose change along!